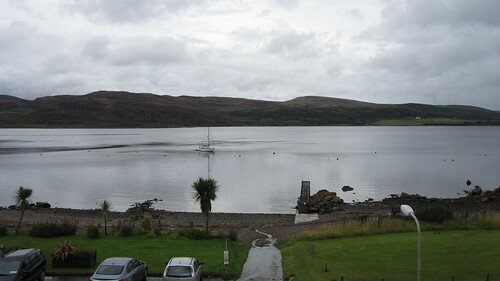 After filling out stomachs once again, we made our way to our next hotel which was An Lochan, Tighnabruaich on the Kyles of Bute. Previously known as The Royal Hotel at Tighnabruaich, An Lochan is a grand old Victorian building some modern touches. Upon arrival we were greeted by John, the very friendly hotel manager who seemed to work every waking hour and yet was still always cheerful. He seemed to be so excited that he had a couple on their honeymoon that he couldn’t wait to tell us that they’d be giving us “a wee bit of complimentary fizz” to help us celebrate! My starter was absolutely perfect. The hand-dived local scallops were juicy and went really well with the classic combination of black pudding and apple puree. The curry oil was a nice touch for a bit of spice too! Suzy was a bit disappointed with her langoustine ravioli as the other items on the plate were a little over-powering for the delicate flavours of the langoustine. 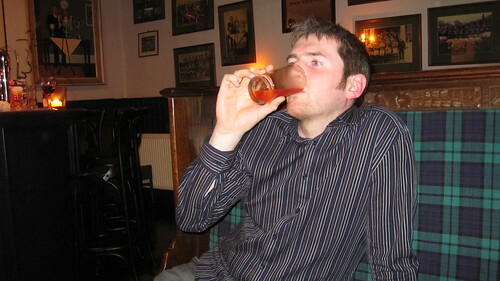 After desserts (both of which were great) we had a quiet drink in the cosy Shinty Bar at the back of the hotel. For breakfast, Suzy had fruit and yoghurt followed by kedgeree and I had cereal and a full Scottish breakfast, complete with black pudding and haggis! We then spent the day in the small town of Dunoon. 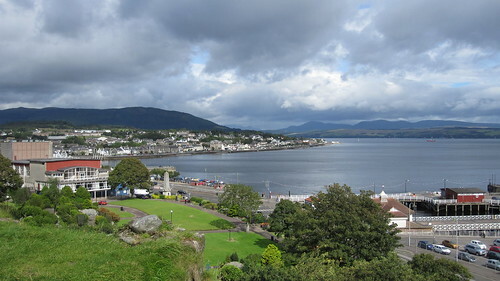 One of the few places to visit in Dunoon is Castle House Museum, which is right next to a viewpoint which offers some great views of Dunoon and across the Firth of Clyde towards Gourock. On the way back to the hotel, we took a few more photos of the views of the Kyles of Bute and then had a very quick visit to the tiny Tighnabruaich Village and Port before going for a walk down the stony beach before dinner. 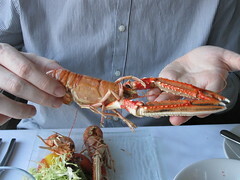 Once again, I thoroughly enjoyed everything, especially the huge langoustine on my starter, although I was a bit disappointed with the size of the fillet on the main course. And once again, Suzy thought the venison was over-powered by the rest of the flavours on the dish and thought the fish and chips was nice but average. It’s a shame really as the hotel is great and the food was good, but I think we had much higher expectations given the standards at the previous hotels we’d visited and the fact that An Lochan has received several awards and acknowledgements. The desserts were both really tasty again though. After finishing those, we retired to the Shinty Bar again for a “wee dram” before bedtime. well written...do you ever stop eating??? Drawings Coming to Google Docs?